Its been quite while since we were out for a ‘serious’ walk, the weather has been wet, cold, cloudy and windy, and on the very few days when the weather has been favourable all the gardening jobs had to take precedence, you just can’t do them when its blowing a gale and/or pouring with rain. The injured leg was discharged from hospital on 4th April and the healing process is well under way. Local walking, both on the flat and on gentle slopes, has increased confidence to the point where slightly more challenging gradients can now be undertaken. This walk was ideal for both the leg and the confidence. On the understanding that today was forecast to be the best one of the week we crossed a few more home and garden chores off the to-do list over the Bank Holiday weekend and bided our time. Our patience and forbearance are rewarded with this beautiful morning and an absence of crowds, so here we are parked up at Dale Head in readiness for our walk. As the leg is fine with walking on the flat we decided to drive up to this point rather than walk to keep sufficient energy in its tank for later on in the walk. This is a look back down Martindale towards Steel Knotts which is on the skyline just to the right of the trees. It was at this point we observed the stag rut in October 2016. Information about the deer conservation area and where you can and can’t walk. I’ve never found it to matter very much where you walk since you are unlikely to come eyeball to eyeball with the deer. They can see you long before you see them and they turn tail without you ever knowing they were there to begin with. We left home in chilly and frosty conditions but the day is warming up nicely now as we begin the walk across the hillside behind Dale Head Farm, although it isn’t a working farm any longer. Out of shot, to the left of the photo, a large hare was running at full pelt backwards and forwards across the fields. It seemed to be doing it just for the fun of it because when it reached a wall it immediately turned around and raced back over to the opposite wall. Perhaps it was just glad that the weather was, at last, good enough to be out in, I know we were. We continue across the field with The Nab on our left. The Nab brings the valley of Martindale to an end but creates two new ones, Bannerdale on this side of it and Ramps Gill on the far side of it. The view along Bannerdale up to Bannerdale Head. The last time we came along here was on a boiling hot day in July 2014 when we followed the lower path alongside the wall all the way to the ridge. Today we are taking the higher and wider grassy path up to the ridge. We had a brief stop here to remove our jackets since it was fast becoming just a little too warm to keep them on any longer. A little further on and another stop to remove another layer, we are now down to short sleeves. The photo shows just how nice a route this is, especially good for the leg rehab since its not at all stony and its not too steep, and a steady plod all the way to the ridge will do wonders for the leg and help it regain some of the fell fitness it has lost over the past three months. The path narrows slightly as we get nearer the ridge line but its still mostly grassy and even. 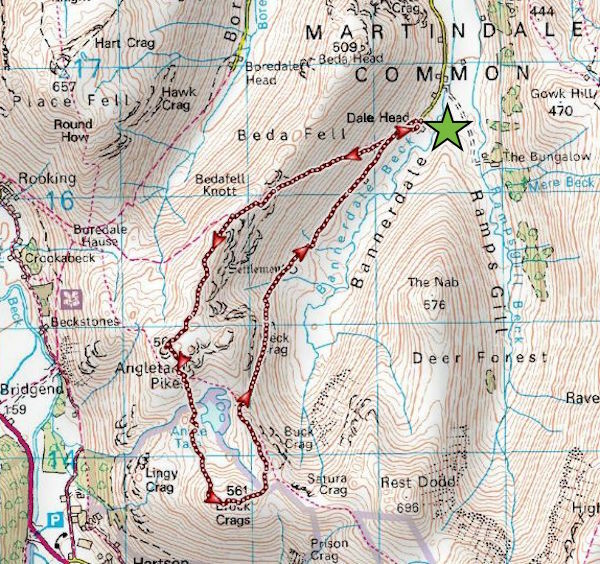 We’ll emerge onto the Beda Fell ridge just beyond the craggy area on the skyline, which is Bedafell Knott, Once there we’ll assess how the leg is doing and then decide on what we do next. A look back along our route and a chance to check up on how the leg is coping. Everything is fine so far and keeping to a slowish but steady pace seems to be working well. We reach the sheepfold just below Bedafell Knott where the path continues to be smooth and grassy and a pleasure to walk on. The sun is shining, the skylarks are singing overhead and its just lovely to be out walking again. On the skyline, beyond the sheepfold, is Heck Crag and to the right of it is the Beda Fell ridge. I know it doesn’t look it but we are very close to reaching the ridge at this point. The path skirts rounds the sheepfold and carries on just a little further before reaching a short, but quite steep, climb up on to the ridge. On the skyline is the Wether Hill to High Raise ridge route. Just below us is a junction marker cairn, and the path going out of shot to the bottom right is the one we’ve just popped out of to gain the ridge. From there we could have turned to our right and headed back across the ridge to the summit of Beda Fell. However the leg is doing fine so we decided to press on and go across to Angletarn Pikes. Once we got up here we began to feel the nip of an intermittent easterly breeze although as we were still climbing and still feeling warm we decided against adding an extra layer for the time being. The walk across to Angletarn Pikes offers some lovely views to the west, especially of the Helvellyn range, seen here on the centre of the skyline. While I’m waiting I take another look around and zoom in for this shot of Glenridding village below me at the head of Ullswater. Another close up, this time of the Helvellyn range taking up most of the skyline. Below it is Birks Fell and below that is Arnison Crag. While I’m in close up mode let’s have one of Saint Sunday Crag too. Just below the summit is its subsidiary peak, Gavel Pike, which is showing up well today’s good visibility. This view looks towards the head of Deepdale, which is littered with knotts and crags of all shapes and sizes, above which rise Hart Crag over to the left, with Fairfield to the right of it. A longer view of the previous shot and now we have the north top of Angletarn Pikes on the left and Saint Sunday Crag on the right completing the picture. Looking due south, more or less, toward Brothers Water and below me on the left I notice two walkers, the first people we have seen today. There are paths on view all over the place from this vantage point and there’s not a single walker to be seen on any of them. I bet it was a different story yesterday on Bank Holiday Monday. A closer look at the wind ruffled Brothers Water and its surrounding fells. A look back at Place Fell and more empty paths. Alongside Brothers Water are the tree lined slopes of Hartsop above How. Although it isn’t very high its a long and sprawling kind of fell and it always seems to take forever to walk along its length up to the summit. Below us the Patterdale fields are greening up nicely. Still on the north top but this time with a view to the south. Now that we’ve stopped its also getting a bit chilly in the easterly breeze so I think its time to get the jumper back on. From the slightly higher north top the rather nondescript lump of rock across the grass is the south top. Not a huge distance to travel between the two tops and the view from the south top makes it well worth a visit, but its not very often we see walkers making the short journey across to take in the lovely view below it. Between the two tops is this very boggy area but its easy enough to skirt round it and make the short climb up onto the south top. On the south top of Angletarn Pikes with the jumpers now back on again as its just a bit chilly standing around in the nippy easterly breeze. The breeze is also giving me a hair makeover. Looking over my shoulder I noticed that a couple of walkers had arrived on the north top, they didn’t make the trip over either. There are the two walkers just mentioned and me wanting to yell at them to come across and have a look at this view …..
…. of the lovely Angle Tarn, but they didn’t, so we continued to have it all to ourselves. Across the way are Brock Crags and after some discussion about the state of the leg, and having been assured that it is still coping well, we decide to carry on up there. The area between here and Brock Crags can be very wet so we could well end up with soggy boots. We take a short pause after descending from the south top because the injured foot begins to ache when going downhill at present, although it poses no such problems going uphill. We’re assured by the doctors that all these aches and pains will eventually disappear so its just a matter of being patient and keeping to the physio’s exercise routine. As we looked back we noticed that more walkers were now appearing, a largish group on the Pikes and three or four pairs walking on the various paths around the tarn. A slightly different view of, and almost flat calm on, Angle Tarn as we cross over to Brock Crags. Still on the way to Brock Crags and on our left we can just see the rounded hump of Rest Dodd on the skyline …..
….. and not too far away from us is the summit of Brock Crags. We still have dry boots too, just in case you were worrying! The summit cairn on Brock Crags where there is still no-one else around. A slightly different view of Brothers Water from Brock Crags and beyond it are the green fields at the bottom of Dovedale. The extensive view to the west from Brock Crags summit. The view on our left is rather less than thrilling as we leave Brock Crags to make our way over to the path to return to Angle Tarn. Its a wet, boggy area so its a good idea to skirt around it rather than just go barging straight through the middle of it all. We’re in a bit of a dip across here so apart from Rest Dodd, on the left, and Rampsgill Head, on the right, there isn’t a whole lot else to see at the moment. Once out of the dip on our right is this striking view to the south of us. In the centre is Gray Crag and immediately behind it you can just see Thornthwaite Crag. On the left of the shot is broad plateau of High Street while over on the right is Stony Cove Pike. Even with the fleecy white clouds dappling and softening them these higher fells still manage to look very imposing. Neatly sandwiched between High Street and Gray Crag is Hayeswater, but no walkers to be seen on the path leading up to it. A view of Angle Tarn is always in sight as we make our way across to the path which runs below Satura Crag. Ahead of us is the afore-mentioned Satura Crag with a very noisy group of walkers also making their way towards the main path. From Satura Crag there is a grand view along the length of Bannerdale. The white dot at the far end is Dale Head Farm where we began our walk so there’s a bit of a way to go yet. A couple of shots of Angle Tarn before we head back down …..
….. where the water is quite still and provides some good reflections of the clouds. We reluctantly turn our backs on the tarn and begin to make our way down to Bannerdale using the Heck Crag route. A short way down the path and time for a look back, so far so good, but the path will get narrower as it traverses the fell side below Heck Crag so we’ll have to see how the foot stands up to the descent, given that it isn’t at all happy when asked to go downhill. Two pink ladies basking in the sunshine and whiling away the afternoon on a grassy knoll high above Bannerdale. The foot needs a rest for a few minutes so I take another look back along the route and the narrow path which we’re using. As you can see, here and there along the path you come across little obstacles such as this rock jutting out across it. Not much of a problem when you have two good legs and feet, if you haven’t then they take a little more negotiating than would otherwise be necessary. However with some assistance the foot coped with it and made it safely across.There were also a couple of places where the path had fallen away which meant stepping slightly higher up onto the grassy slope to be able to continue. The foot definitely did not like the combination of clumpy grass and a steep slope. We still have a little more or the narrow path to negotiate but it won’t be too much longer before we reach the flatter grassy one alongside the wall, the foot will be a lot happier then. The narrow path is behind us now and we have the luxury of a wide and grassy one. We’re not at the valley bottom just yet so the foot still has some more downhill to deal with. In the valley bottom at last and, for the aching foot, the comfort of a wide, flat and grassy path. After only a few yards along the path the foot stopped aching and gave no further trouble. If we could get the walking downhill problem fixed that would be a huge leap forward. While I’m waiting I took a last look back along Bannerdale noticing that the skies have turned much cloudier and the sunshine has virtually disappeared so it looks like we’ve had the best of the day. When we came along here in July 2014 there was no gate, just the stile and an old run down fence so somebody has been busy in the intervening years. The fields are gradually filling up with them so here’s today’s cute lamb picture. Almost back to Dale Head Farm where the car is parked on the road just behind the trees. For the foot’s benefit I’m relieved that we opted to park as far up the valley as possible because, right now, it might not have been able to make the long walk back down the valley. However, apart from the downhill return, the injured foot has coped extremely well and was able to complete the walk, all the more remarkable since we didn’t start out intending to go as far as we did. Opposite the former farmhouse is this barn, currently doubling up as a maternity ward where the mothers to be were patiently awaiting the arrival of their lambs. In pens at one end of the barn some newly born lambs were being nursed by their mothers but I decided not to take any photos since it was quite dark at that end and I didn’t want the camera flash to startle them. The newly refurbished farmhouse at Dale Head. Work was still taking place when we came by here in 2014 and I seem to recollect from that walk that there was some notice indicating that the building was going to be used as an outdoor centre or something similar. There was nothing to indicate that today so I don’t know if that plan came into effect or not. The car is parked just a couple of yards behind me so that’s the end of today’s walk and it has been a very enjoyable one for a number of reasons, the good weather, the lovely path across Beda’s slopes, the peace and quiet, and most of all the injured foot being able to cope with most of it. Now the foot is going home for a soak in a warm bath and I’m going home for a nice cup of tea.